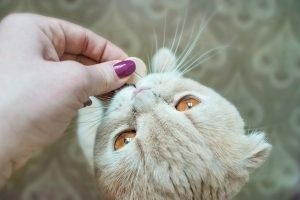 When dispensing medication for in-home treatment of feline patients, owner compliance is a concern due to the unique challenges of administering medication to cats, according to Kindred Biosciences Inc.
Communication is essential, said Fernandez. Veterinarians or veterinary nurses can demonstrate to cat owners how to administer a medication while still in the office. This helps avoid complications and promotes active discussion with the client. If possible, written instructions can be provided. Prescribing medications that are easy and convenient to use can also improve owner compliance. Fernandez encourages veterinarians to explore new FDA-approved medications that offer the ease and convenience of topical application.